A person who flew across Australia in July with 800 test strips, 200 syringes, 2 boxes of insulin, 2 blood glucose meters, a travel letter, a plastic sharps bottle, spare lancets, batteries and insulin prescriptions. A person who placed his belt, watch, phone, camera, insulin pen and glucose meter onto a tray in order to get past security at Parliament House in Canberra on the afternoon of Tuesday July 7 2015. A person who was fighting the urge to consume a whole packet of losenges to combat his sore lumpy throat on that freezing cold afternoon. A person who stood proudly on those steps inside Parliament House, with his jacket pockets stuffed full of diabetes crap. A person who is relatively healthy, and still able to do relatively “ordinary” things, despite having diabetes. Type 1 Diabetes looks like me. And I’m very proud of that. 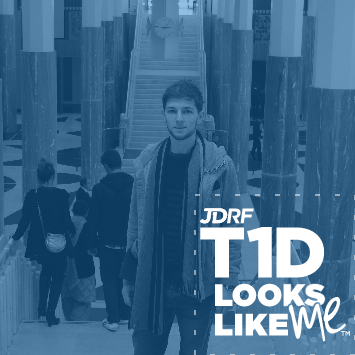 You can create your Type 1 Diabetes Looks Like Me photo at jdrf.org/t1dlookslikeme and join the sea of blue on social media this November.